Anyone that knows their roofing has used Cromar products before. Here at JJ Roofing, we are happy to offer the Cromar Vent 3 Light Breathable Felt at very respectable prices that you will love. We know what it takes to exceed the industry standards and deliver outstanding results every time. This is why we stock the Cromar Vent 3 Light Breathable Felt which is available for immediate dispatch for rapid delivery turnaround times. This great example of a lightweight, breathable roofing underlay is right at home in both cold and warm roofing applications. This, along with its brilliant performance characteristics, makes it extremely beneficial and aids in the installation process. The material of the Cromar Vent 3 Light Breathable Felt is definitely worthy of taking note of. The team at JJ Roofing has experience in differentiating between products that will stand the test of time and those that will not. The Vent 3 Light is triple layered, which features two other layers of high tensile, non-woven, spun bonded polypropylene, and one internal micro porous polyethylene film layer. Unlike many of the competing products in this category, the Cromar Vent 3 Light Breathable Felt has its layers thermally calendared together – not just economically glued together with adhesive. This gives the finished underlay membrane performance characteristics that set it apart from the competition. The Vent 3 Light features full moisture permeability, which allows humidity that would otherwise cause damp issues to escape. 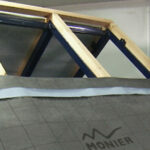 On top of this, the underlay membrane maintains the highest levels of water resistance and weatherproofing. Even in the most challenging weather conditions, this layer will keep your clients satisfaction with the results at the highest possible level. If you are looking for a product which exhibits vapour permeability, water resistance, high tensile strength, high nail tear strength, then you will be pleased to know you have found it. This makes it ideal for usage on cold and warm roofing projects alike.